"I have a 2.88GB DVD and want to import the DVD into iTunes so I can watch it easily and send it to my friends. I know that M4V is a famous format for iTunes, so I wonder how I can free rip DVD to M4V easily. I'm not a tech-savvy so I want it to be done simply enough." This post will show you how to convert DVD to M4V for free on macOS and Windows. You can import the DVD converted M4V videos to iTunes, sync with iPhone, iPad or play on Apple TV, QuickTime, VLC, other players, edit with iMovie, Final Cut Pro etc. It's suitable for both newbie and advanced users. Notice: This walk-through is not intended to encourage or facilitate piracy. It is the user's responsibility to observe all applicable licensing and copyright laws. There are many DVD rippers on the market, free or paid. However, seldom of them support M4V as an output, for example, RipIt and MakeMKV. To save your effort searching for a ripper that well balances the speed and quality, here the free DVD ripper - MacX DVD Ripper Mac Free Edition is a good try. The multi-core CPU, super encode engine and hyper-threading technology guarantee 5x faster DVD ripping speed than other DVD freeware. Step 1: Insert the DVD into the drive and launch the ripper. Click the DVD button to load the disc. Step 2: To free digitize DVD discs to M4V, simply select M4V as the output format from the format list. Besides that, you can also rip DVD to MP4, DVD to MOV, MPEG4, H.264 etc for iPhone, iPad, iTunes, Apple TV, iMovie, other mobiles and phones. Step 3: Click the browse to set an output folder to save the DVD ripped M4V files. A range of editing options is offered. Click Edit button at the end of the DVD title, then you can trim the DVD length, add subtitles, capture your favorite part, crop and expand the video and etc. Step 4: To free convert DVD movies to M4V without problems and with best results, check the boxes Safe Mode, High Quality and Deinterlacing. After all the settings, click Run and start the ripping. Note 1: If you want a faster ripping speed (No.1 fast with Intel QSV hardware acceleration tech), more choices of built-in devices, or more extensive support for protected DVDs, there is a Pro version for advanced users - MacX DVD Ripper Pro. Note 2: If you're converting DVD to M4V to watch on iPhone or iPad, you don't need to import the converted M4V via iTunes. There is a drag-and-drop solution, which enables you to import as many videos as you want into iPhone or iPad with one click - MacX MediaTrans. What Makes MacX the Better DVD to M4V Converter Choice over Handbrake? As Handbrake always maintains the led in the realm of free DVD rippers, and even the paid crowd, why is MacX DVD Ripper Mac Free Edition recommended as the top choice to free rip DVD movies to M4V format. While Handbrake converts movies on DVDs to m4v if the output contains AC3 audio, SRT subtitles or chapter markers, we see MacX a better choice. What is M4V format- An M4V file is an MPEG-4 video file, or sometimes called an iTunes video file, which is most commonly used in the movies, TV shows, music videos, and other video contents downloaded from iTunes Store. The M4V may be protected with Apple's FairPlay Digital Rights Management (DRM), which limits the playback of M4V files to only authorized computers and iOS devices. And unprotected M4V files can be played on most devices and players. The M4V files ripped from DVD normally do not contain DRM. M4V VS MP4- M4V and MP4 are almost identical. Like MP4, M4V is also based on MPEG-4, but it uses AVC video compression. MP4 is more widely used for internet distribution and streaming, while M4V is specially designed for Apple products like iPhone, iPad, iTunes store, Apple TV, QuickTime Player, iMovie, Final Cut Pro etc. Though, as M4V is becoming popular, more and more player, devices and software have the support for M4V format. Besides, m4v is often copyrighted via Apple's FairPlay DRM copyright protection. In other words, if you want to play the file freely, convert the DVD to MP4; and if you want to play the DVD on Apple devices or computer players, then free rip DVD to M4V. 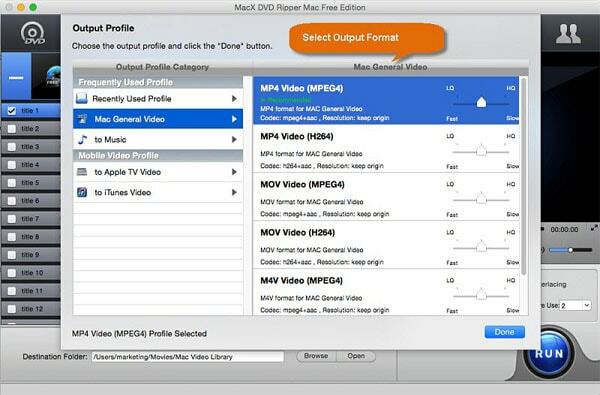 Best free DVD to iTunes ripper - MacX DVD Ripper Mac Free Edition enables users to freely rip commercial & homemade DVDs to DVDs to M4v, MOV, MP4 and more formats with high quality reserved.